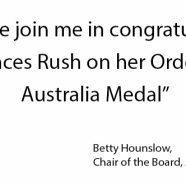 I’m thrilled to announce that the Asylum Seekers Centre’s CEO, Frances Rush, has just been awarded an Order of Australia Medal (OAM) in the Australia Day Honours for her “service to the community through social welfare organisations”. This is a well-deserved recognition for Frances’ contribution to making our country a better place throughout her career, including her great work at ASC over the years. I’m sure you will all join me in congratulating Frances on this well earned achievement. Last weekend was very special for ASC as not just one, but two ASC volunteers, Jude Stoddart and Margaret Tung, received the 2019 Inner West Senior Citizen of the Year award. This award recognises the outstanding contributions made by Jude and Margaret in enhancing the welfare of the general community through their work with ASC’s Employment service. Every day, with the support of volunteers like Jude and Margaret, people take steps to find employment to support their families and connect with Sydney’s community. More than 400 people from all walks of life volunteer at ASC. For many of our volunteers, doing something practical and positive is a way of showing that there is a more humane way to treat people seeking asylum than those demonstrated by our current Federal Government. For so many this is what drives people to walk through the Centre’s doors and offer their skills and time. These awards recognise outstanding individual contributions. They also are a tribute to the importance of our work by the wider community. Please join me in congratulating Frances, Margaret and Jude.